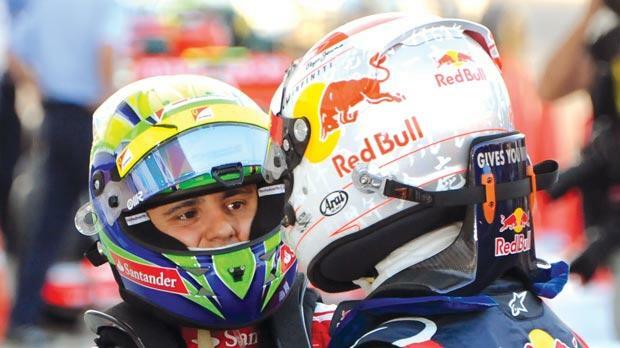 Ferrari will keep Felipe Massa (left) for 2013 despite links with Sebastian Vettel. Felipe Massa will stay at Ferrari for the 2013 season in an unchanged line-up with Fernando Alonso, the Italian Formula One team said in a statement yesterday. The Brazilian has struggled for form in recent years but has agreed a one-year extension amid continued speculation that world champion Sebastian Vettel could join Alonso at Ferrari from 2014. Alonso’s contract runs to the end of 2016. Massa’s future has been the subject of speculation all season, with the 31-year-old suffering an abject run until he finished second at this month’s Japanese Grand Prix for his first podium finish since 2010. The Sao Paulo driver was fourth in South Korea on Sunday, round 16 of the championship, a result that meant he had scored more points in his last two races than he had in the first 11 of the season. Ferrari’s decision was not a great surprise, with Alonso clearly favouring the Brazilian as his team-mate having established himself as the clear focus of the sport’s most successful team. Massa’s poor form in the first half of the campaign has hit Ferrari hard in the constructors championship, however, where they are currently second to Red Bull but still 77 points off the lead. Double champion Alonso has scored 209 of those points and Massa’s fate was determined after a meeting with Ferrari president Luca di Montezemolo at the Maranello factory yesterday. Montezemolo said on Monday that Massa, who suffered near fatal head injuries when hit by a bouncing spring in qualifying for the 2009 Hungarian Grand Prix, had returned to the level expected of him. The Ferrari decision will be a blow for those who had been touted as possible replacements at the most glamorous team in the sport, notably the Force India pair of Briton Paul Di Resta and Germany’s Nico Hulkenberg. The attention will now turn to the Swiss Sauber team who have at least one vacancy, with Mexican Sergio Perez leaving to join McLaren as the replacement for Mercedes-bound Lewis Hamilton, and possibly two if Japan’s Kamui Kobayashi is not retained. Hulkenberg is considered a hot favourite to take one of those places.